­Sometimes, it can be difficult to figure out how ancient organisms used to eat. Part of the problem is that we can never actually see extinct animals eating (until we invent time-travel.. *taps fingers impatiently at physicists*), and often it can be hard to work out how something ate based just on its anatomy. Sometimes though, the fossil record chucks up something truly spectacular, and gives us amazing insight into the spectacular diversity of ancient life. Let’s roll it back a bit. During the Mesozoic period, some 252-66 million years ago, the seas were ruled by a vast and intriguing array of reptiles: the most common ones we perhaps think of are plesiosaurs, the loch-ness monster wannabees, and ichthyosaurs, the over-sized predatory tuna. But we also had crocodiles that had adapted to swimming out in the oceans, and turtles! Turtles didn’t become fully adapted to a marine lifestyle until some time during the Late Jurassic or Cretaceous period, when a group called Chelonioidea got really big and decided to take to the seas. 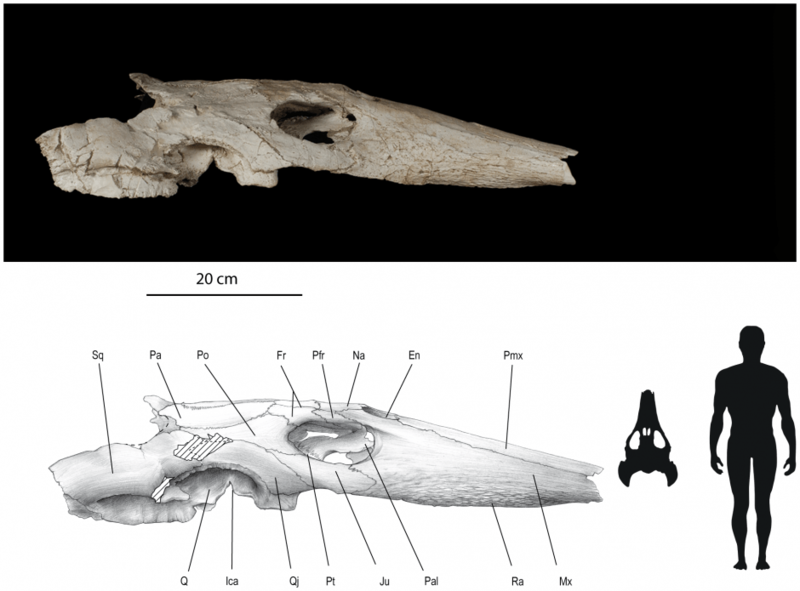 A new one, named Ocepechelon bouyai, is known from a rather exquisitely preserved skull from the Late Cretaceous of Morocco. The skull is rather unique among a wide variety of Cretaceous chelonioids, and reveals some rather unusual things about it. Modern crocs have their nose-slits (external nares) and eye sockets (orbits) placed on the top of their head (dorsally), so they can hunt close to the surface. This is what we see in Ocepechleon too, implying a similar lifestyle. The most striking thing about Ocepechelon though is that it had a bony pipette-like snout, something that is unique among all animals with four limbs (tetrapods). 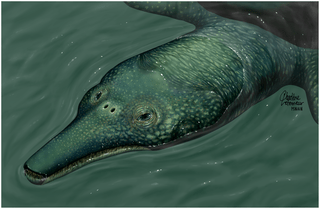 Additionally, the snout did not possess any tooth-like structures, so it would have to have some other way of capturing prey items, especially given that it only had a teeny mouth. The only remaining option really is that Ocepechelon was a suction feeder, a quite widely used form of feeding in fish, amphibians, and some modern aquatic turtles and mammals. Given the size of its mouth, you can infer a maximum prey size, so it’s likely that Ocepechelon fed on things like small fish, squid, or jellyfish, or any other item unfortunate enough to get gulped down. It would do this, similar to beaked whales, by creating a depression within its skull (particularly a region called the buccopharyngeal cavity), which would create a suction force and drag water and prey into its tubular mouth. Weirdly, this is the kind of structure we find in animals like seahorses and beaked whales, showing widespread convergent evolution to take advantage of a rather unique and specialised way of feeding in the seas. In these animals though, the suctiony part is usually formed from some sort of soft tissue, which isn’t preserved in Ocepechelon. What makes Ocepechelon truly unique though, is that the suctiony part (or tubular rostrum, or buccal tunnel) is formed from the skull bones. I wrote a couple of weeks ago about how crocodiles having an incredibly diverse array of feeding techniques and styles may provide clues to their long-lived success. Perhaps the same is true for turtles, compared to non-avian dinosaurs? I say non-avian, as they went kaput at the end-Cretaceous boundary, whereas the avian theropods are actually the most successful land-dwelling tetrapod group currently alive. Perhaps feeding strategy diversification during the Late Cretaceous was one of the keys to all of these groups avoiding total extinction?